The Beddes Bunch: ABC's of Summer-letter B! 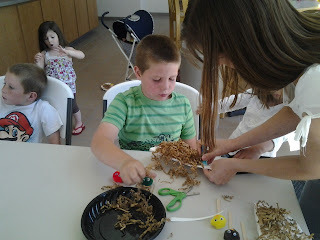 On June 19th we did all sorts of fun things that begin with the letter B. 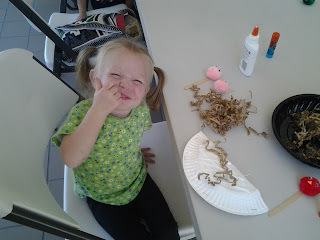 We went to the school for lunch and the kids played on the BUS, we went to the library and checked out some BOOKS, and we made a BIRD nest with little BIRDS at the library make and take. We played BALLOON Golf and we even had BURRITOS for dinner. 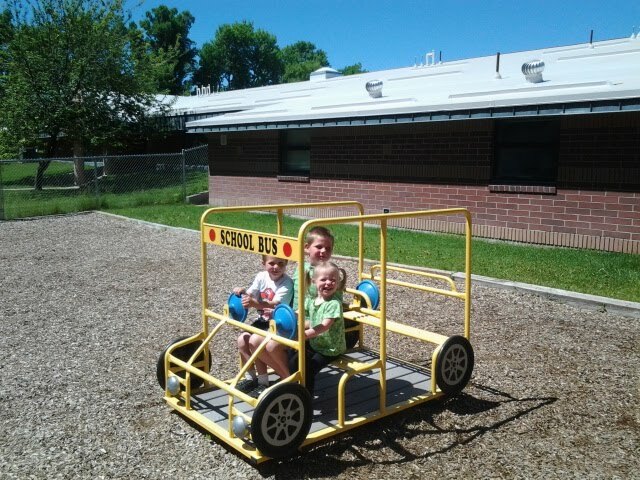 Here are the kids on the playground at the school playing in the BUS. This is Gracie's favorite place to play. She would sit and "drive" the BUS all day if I let her. This is the place where Gracie gets the BOOKS she BORROWS from the library. 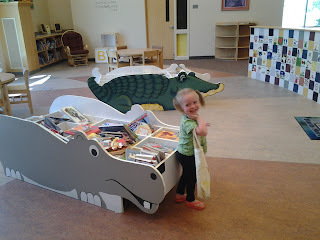 They have a hippo and an alligator and it is so easy for the little ones to get their own BOOKS from here. There is really no rhyme or reason to how the BOOKS are in there so you don't have to worry about the little ones pulling a BOOK from somewhere and trying to put it back in the right place. After we checked out the BOOKS, we went over to the make and take. The kids were pretty excited about making the nest and the cute little BIRDS. It was super easy. Fold a paper plate in half and staple it closed along the curved side. Cut along the fold. 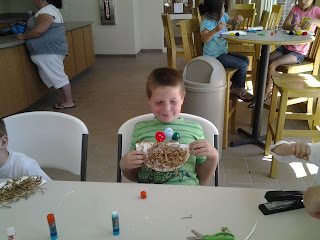 Glue BROWN paper to one side of the paper plate. This is the nest. Glue one pompom to a craft stick and then glue eyes and a BEAK to make your BIRD. Make as many BIRDS as you want in as many different colors as you want. 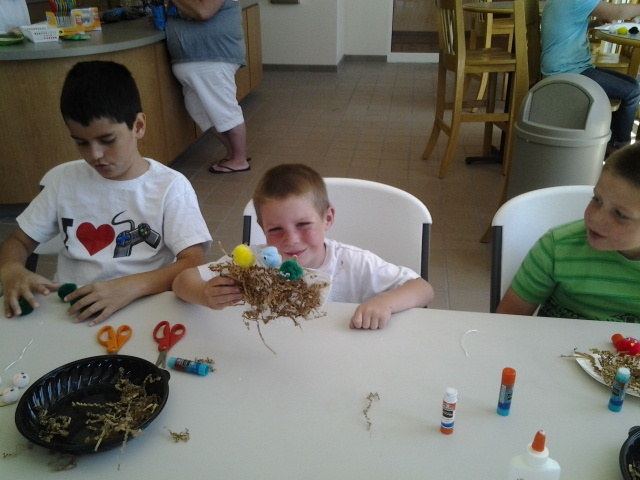 This is BENJAMIN'S finished BIRDS in the nest. 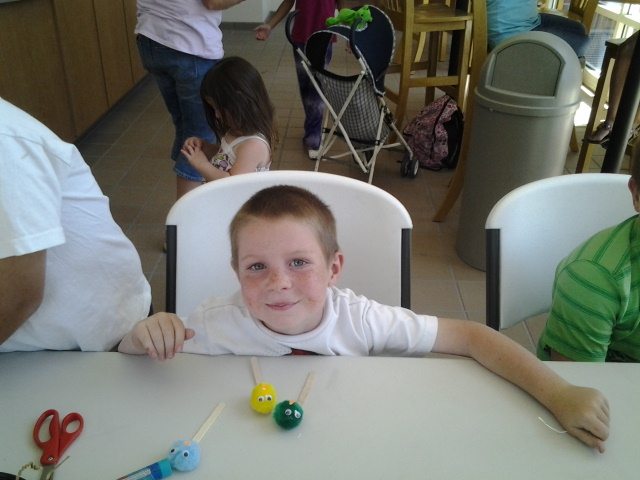 He chose to make a BLUE BIRD, a green BIRD and a red BIRD. Here is Alex's finished project. He chose to make a BLUE BIRD, a green BIRD and a yellow BIRD. Gracie just had to have pink but there were only two pink left so I talked her into having a red BIRD also. To play BALLOON Golf all you need is a BALLOON for each player. (It helps for each player to have a different color.) Pick a starting location and an ending location and flip the BALLOON until it reaches the ending location. Count how many times you flip it and that is your score for that "hole." Make yourself a simple score sheet like this and you are ready to play BALLOON Golf!